Baling | Caristrap International Inc. Textile bales can be made under greater tension, thus reducing bale size and shipping costs or allowing more material to be compacted per bale. This is a major achievement in days of high transportation costs. Our strapping can also be used with or without buckles (bailing knot – see below). The baled fibers will not break, allowing it to be sold at a higher price. Only half the bonding straps are used per bale, saving time and money. Bales can be compressed an additional 10-20%. (100-110 bales using caristrap will fit in the same space as 90 bales using steel strapping). 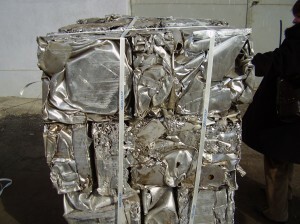 Bales will not get contaminated, and the strapping can often be thrown in with the recyclable mixture. Coils packaged to match baler models. Only 3lbs (1.4kg) of Caristrap will do the same job as approximately 18lbs (8 kg) of steel strapping (for a standard bale of sisal). Sealing is easily done using baling knots. Eliminating the need for buckles reduces material and labour costs. Injuries are prevented because Caristrap will not lash out or hurt the person opening the bale. Freight costs are greatly reduced because our strapping weighs 80% less per foot (or per meter) than steel strapping.